Sotoshu's English site includes a page of baika information, with a downloadable introductory songbook and a few recordings. Baikaryu eisanka 梅花流詠讃歌 is a type of Japanese Buddhist hymn created by the Soto Zen school in 1952 in honor of the 700th anniversary of Dogen Zenji’s death. It pairs both very old and more contemporary melodies with the teachings of the Buddha, Dogen Zenji, or Keizan Zenji. Baika is part of a broader category of Buddhist songs of praise called goeika 御詠歌. 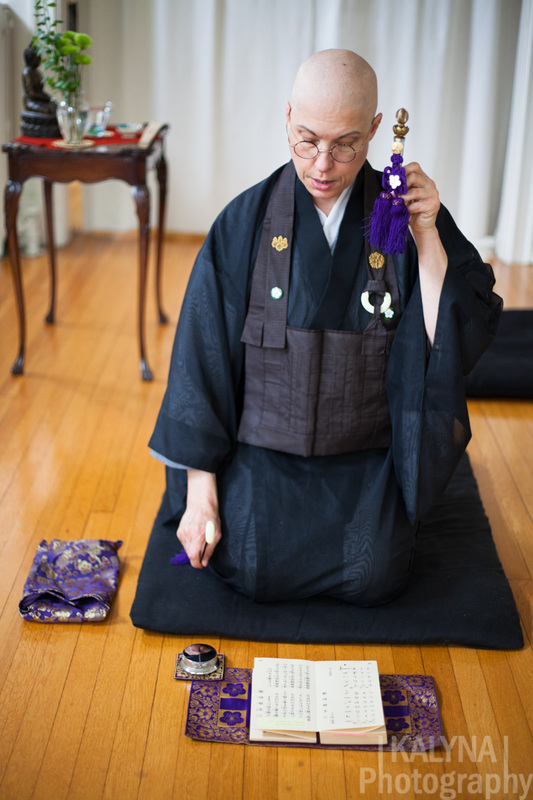 The literal translation of baikaryu eisanka is “plum blossom style recitation praise song.” In the Shisho and Baika fascicles of the Shobogenzo, Dogen Zenji writes about the plum blossom as a symbol of the true transmission and flowering of the dharma from person to person and generation to generation. Read more about baika as a term and how it came to represent this kind of singing practice here. In Japan, baikako, or groups of people who meet at the temple to sing together, form an important social network. Singing at services and celebrations, we share the words and encouragement of our ancestors with many listeners. What kind of bells are used? The sho is a flat round bell that sits on three feet and is struck lightly with a small mallet. The rei is a bell with a handle that is held at eye level and rung by moving it back and forth. There are baika songs that summarize key points of Soto teaching, songs dedicated to bodhisattvas Jizo and Kannon, songs marking various events in the Soto liturgical year (Buddha’s birth and death days, anniversary days for Bodhidharma, Dogen and Keizan, etc.) and songs for events like precepts ceremonies, weddings and memorials. What does the written music look like? Some baika songs are available in Western notation. However, the standard songbook uses a system called hakase in which lines appear next to each syllable, the length and angle of which indicate the length and relative pitch of each note. Circles and triangles indicate when the sho or rei is to be sounded. It is not a difficult system to learn. What's the point of baika in the West, where we don't speak Japanese? We will live according to proper teachings through baikaryu eisanka. We will live in harmony with others through baikaryu eisanka. We will create a cheerful world around us through baikaryu eisanka. Baika gives us an opportunity to spend time with important teachings and to share them with others as part of a physical practice. Certainly it's an exercise in mindful activity, and we offer our songs wholeheartedly to our listeners and to whomever they are dedicated. Do you offer baika workshops? Yes. Workshops can range from a two-hour introduction to a longer event if the sangha wishes. Twelve bell sets are provided for use during the workshop; if there are more than twelve participants they can share sets and take turns ringing, though everyone can sing. There is no charge, though sanghas are asked to cover travel expenses, if incurred.